Happy Birthday MLK!!! Do we strive for greatness as MLK did??? 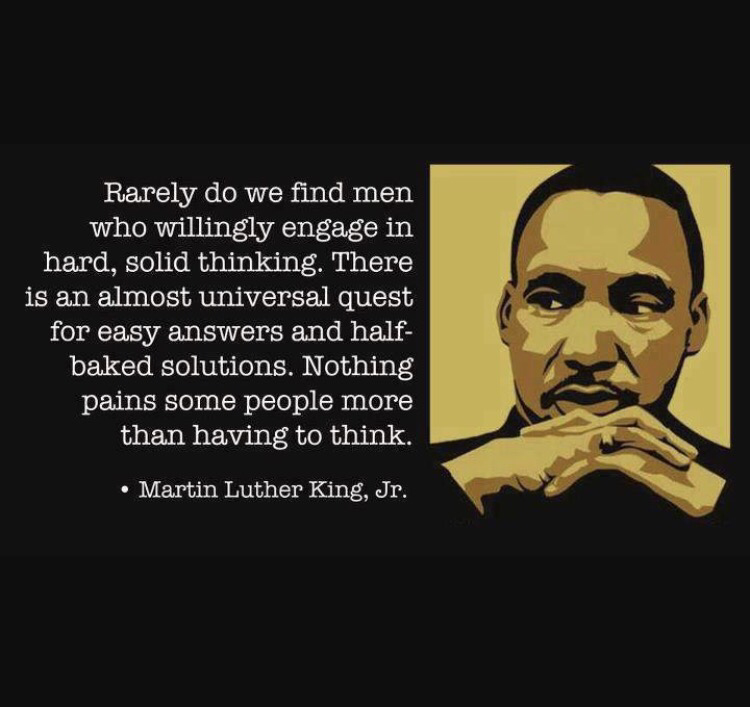 Happy Martin Luther King Jr. Day, today has me thinking about a lot of things that has been going on in our society. A lot of things in particular that people brush aside and don’t pay attention to, in depth. Martin Luther King Jr. was a man that fought for what he believed was right with peace. He fought with the idea that all men are created equal. He made it possible for people of color to be able to get a job in the same workplace as a Caucasian person, to get an education in the same school and be able to go to the same bathrooms and restaurants. He did all the things that a lot of people now, could never imagine themselves doing. He put himself in harms way for the greater good of an entire group of people. He was dedicated and passionate about his fight for a better life for everyone and no matter how much people try to knock him down he still fought until the day he died. So my question for everyone is, what are you going to fight for? Fighting doesn’t mean that you have to march or that you have to protest. Fighting means that no matter what someone tries to do to stop you from succeeding you will prove them wrong. That you will not allow anyone to stop you from doing anything that you want to do because of the color of your skin. Martin Luther King Jr. fought for your right to fight. To be able to have the same opportunities as other people. Though sometimes opportunities are not always the same for everyone but because you are a human being no one can stop you from fighting. Everyone has a different fight, some people are fighting for that perfect job that they want, or fighting for that education that they’ve dreamed of or having small businesses that they’ve always wanted. Whatever your fight is you need to concur it. Martin Luther King Jr. could do it, so you can too. Also remember that your fight is not only for you but everyone like you that is trying to accomplish the same things. Your fight can give someone that feels that they are incapable of success the courage to try. Just like Martin Luther King Junior fight not for yourself but everyone like you.